As part of a trip to Westminster for the “Capital for a Day” initiative, three cabinet secretaries for Governor Martin O’Malley visited Carroll Community College on April 24, 2009. Secretary of Higher Education James E. Lyons, Sr. began his visit with a private meeting with college President Dr. Faye Pappalardo for an in-depth discussion about the college. The president then gave Secretary Lyons a campus tour. The tour was followed by a meeting with members of the board of trustees, college senior management, and students. Secretary Lyons expressed the state’s commitment to community colleges and shared the high esteem in which the Governor holds the state’s 16 community colleges. Secretary of the Department of General Services Alvin C. Collins met with Vice President Alan Schuman and staff and county representatives. The secretary also received a tour of the campus, including the new Classroom Building Four construction site. Secretary of the Maryland Department of Disabilities Catherine Raggio visited with disability services and student affairs staff at the college. The Governor visited other sites in Westminster, conversing with local government officials, touring city projects, and visiting with community members. 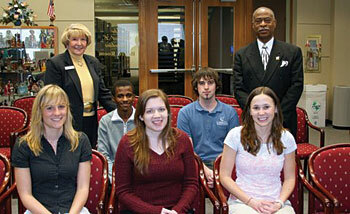 Students attended a meeting with Secretary of Higher Education James E. Lyons at the college April 24th. Front row: Simone Bolton, Jeana Biondo, Bonnie Boczek. Back row: Dr. Faye Pappalardo, Golois Mouelet, Jim Schaeffer, Secretary James E. Lyons, Sr.
All 13 students enrolled in the 99-hour Pharmacy Technician training course passed the national certifying exam to become pharmacy technicians. 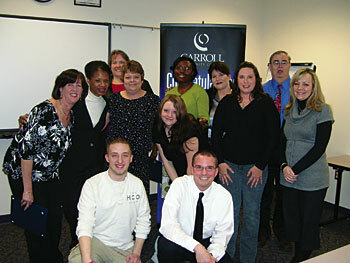 The group celebrated successful completion of their course and their 100 percent national exam pass rate on Feb. 19. National certification qualifies the technicians to register with the State of Maryland as certified pharmacy technicians and practice in the state. The students are, front row from left, David Snuffer and Matthew Ames; middle row, Karen Bowers, Jacqueline Gray, Debbie Asbury, Gwen Brown, Dana Johansen and Joy Bunch; and back row, Carol Schleicher, Ntumbong Yochembeng, Vicki Johnson and Robert Jefferson. Not pictured: Carolyn Schmid.